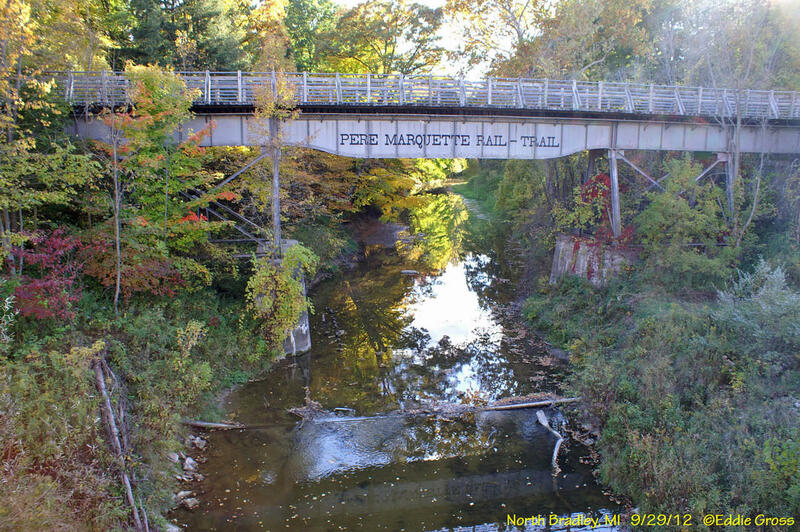 A fun, healthy and educational way to explore the Midland area is to follow the Pere Marquette Rail-Trail of Mid-Michigan. The trail is a 30-mile-long, 14-foot wide ribbon of asphalt tracing a former railroad right of way. The handicap-accessible trail is for non-motorized activities, including walking, jogging, in-line skating, bicycling and cross-country skiing. Extending northwest from Midland to the city of Clare, the trail provides access to city and county parks, as well as historical and natural areas. Parking is available next to the trail in the downtown areas of Midland, Sanford, Coleman and Clare. If a trip on the Pere Marquette Rail-Trail leaves you in love with this route, you are not alone. The Pere Marquette is one of the most heavily used trails in Michigan. The serene, paved corridor welcomes all non-motorized users, including equestrians on an adjacent path for approximately 5 miles between the community of Coleman and State Route 18 (N. Castor Road). There are numerous access points along the trail, as well as benches for trail users to rest and take in the beautiful scenery of maple and pine trees. Kick off your trip in downtown Midland at the Tridge, a unique three-way bridge located at the confluence of the Tittabawassee and Chippewa rivers. This area is known as "The Forks," and within three miles, trail users can experience the rivers, cross an historic bridge at Currie Parkway, enjoy fun activities at Emerson Park, cross a former railroad bridge, visit Heritage Park with the H. H. Dow Historical Museum, 1874 Bradley Home and Carriage House, Herbert H. Doan Midland County History Center, and see the Northwood University campus. The Chippewa Trail extends west from the Tridge, traveling 4 miles to the Chippewa Nature Center. 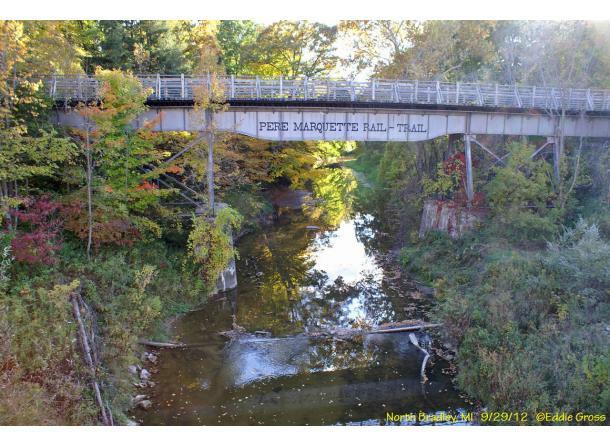 Go north to instead follow the Pere Marquette Rail-Trail all the way to Clare. The trail is a haven for deer, chipmunks, and an assortment of bird species. There are cultural attractions to be had from the very start. Just off the trail in Midland is the Dow Historical Museum, where you can find information and displays concerning the pioneering chemical experiments of Herbert H. Dow. Another interesting cultural attraction, located just off the trail, is the Bradley House. This restored 1874 home offers visitors a glimpse into the everyday life of an early Midland family. The town of Sanford is at mile 8.4 and is a good spot for a lunch break. It has shops and restaurants as well as Sanford Village Park, where you can dip a fishing line or a canoe into the Tittabawassee River. If you are up for a 0.25-mile side trip, head north and cross Saginaw Road to reach Sanford Lake County Park, which has a beach, pavilions, boat launch and playground. Just ahead at mile 9.3 is Veterans Memorial Park, which features 180-year-old red and white pines. The Pine Haven Recreation Area, located at 8 Mile Road, has 8 miles of trails for hiking, mountain biking, and cross-country skiing. In Coleman, the trail has been made the focal point for the city. Exit the trail at the Coleman Staging Area if you want to stop, shop or grab a bite to eat. A bike shop is also located adjacent to the trail. Continuing north, you may decide to stop at the general store in Loomis for a snack. In Clare, you can continue your journey on the Pere Marquette State Trail by taking a wide, on-road bike lane and some city streets for 1.5 miles before meeting up with the 53-mile crushed-stone pathway, which goes all the way to Baldwin. In addition, The Arbutus Bog is about 10 miles from Midland and features a boardwalk so that visitors can walk out in the bog. The trail offers restrooms, boat launches, a swimming area, picnic areas, playgrounds and more.